A recipe title in quotes? So that means I'm not really, only kinda sorta sharing a caprese quinoa salad with you, right? You see, while this particular recipe doesn't necessarily contain all the traditional ingredients of a caprese salad (read: cheese), it does taste eerily similar. Except rather than serving thick slices of tomato, big chunks of mozzarella, and fresh basil on top of a crusty piece of toast, I've bottled up that tasty Italian goodness and threw it into a quinoa salad. You're not surprised in the slightest, are you? We start with tomatoes and basil. The base of all Italian cooking. 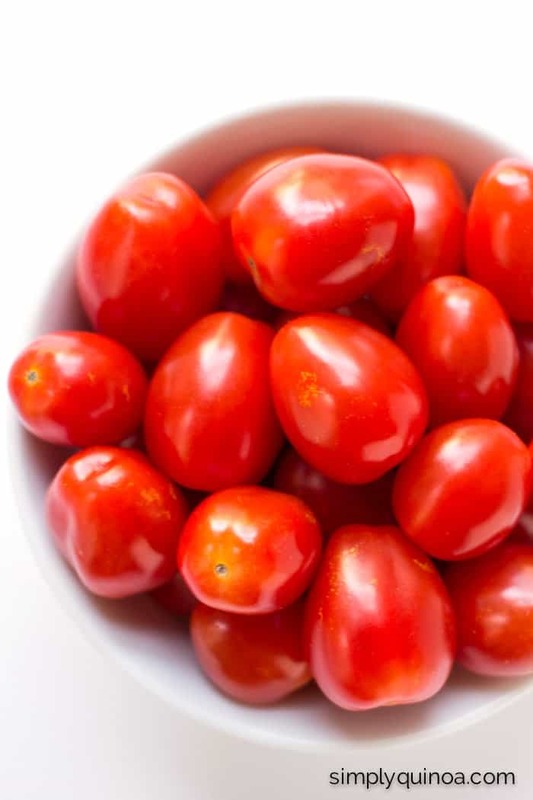 This recipe needed cherry tomatoes. I debated going with the big guys, but knew cherry tomatoes would be a better fit. I mean first there's less cutting and chopping involve (less prep time? hallelujah), second they're not as juicy so they hold onto the flavors of the salad a little better and third, they're pretty stinkin' cute. Plus, they burst in your mouth when you bite into them which totally brings all the flavors together. 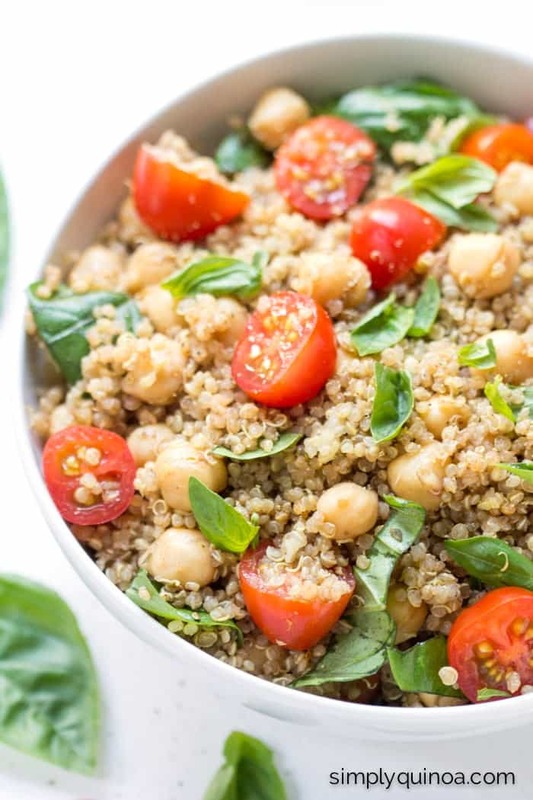 As we usually do, we're starting this lovely salad with a base of fluffy white quinoa. 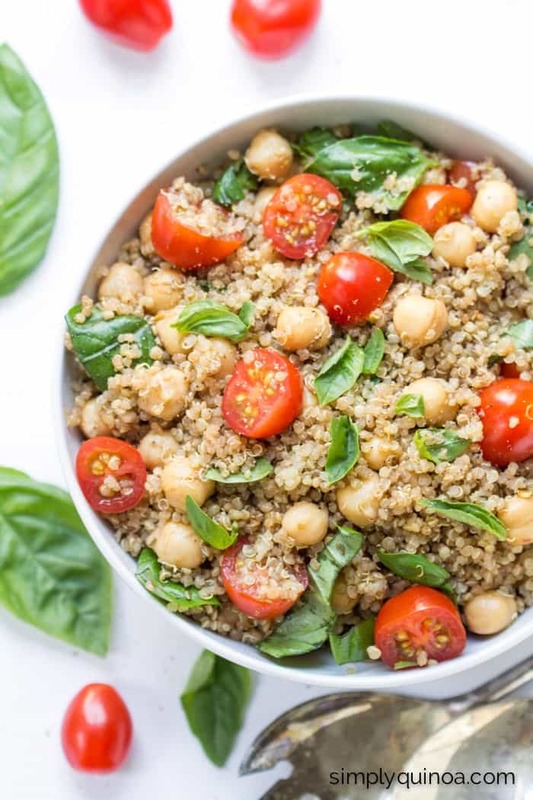 I adore using white quinoa in salads like this because I find that not does the salad stay light and fun, but white quinoa is also super mild in flavor which really lets the other ingredients shine. 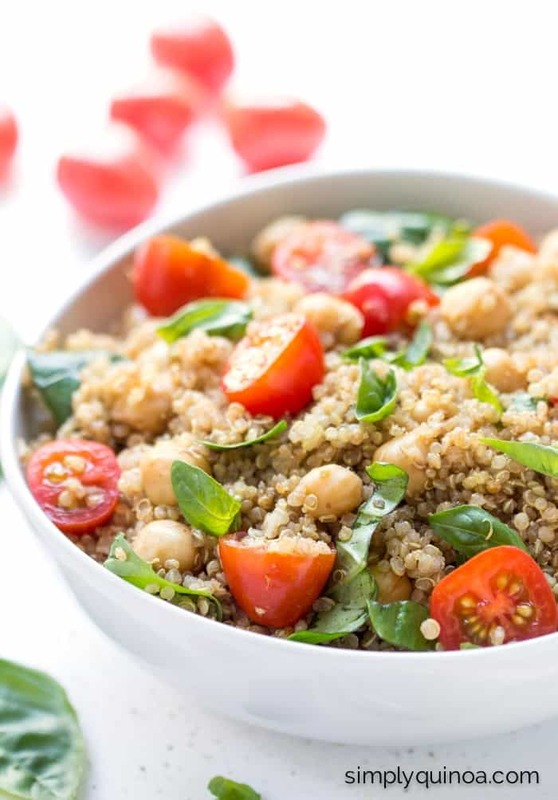 So when you take a bite, you're not overwhelmed with this nutty quinoa flavor (like you would be with red quinoa), and instead are greeted with the succulent flavors of tomato, basil and balsamic vinegar. 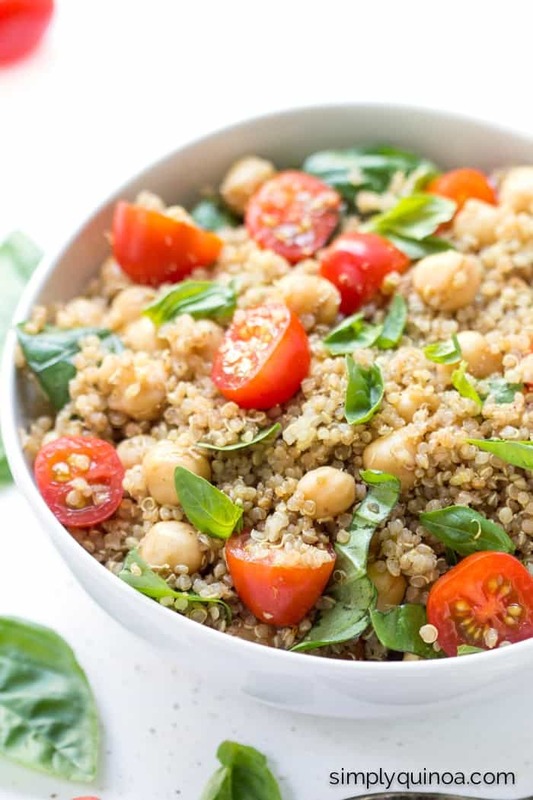 Oh, oh and I also adore that white quinoa is super fluffy because it absorbs any sort of dressing you put on your salad. And the dressing here? Crazy good. Traditional caprese salads are generally served with either a drizzle of olive oil and fresh cracked pepper OR a balsamic reduction (sometimes both if we're walkin on the wild side). Since my caprese quinoa salad is totally UN-traditional, I was able to have a bit more fun with the dressing. I opted for a blend of traditions, going for a quick balsamic vinaigrette which was made with a high-quality olive oil, sweet balsamic vinegar, fresh lemon juice, a bit of fresh garlic and a blend of Italian spices. While it might make the salad look a teeny bit less appealing – it does turn rather brown from the vinegar – the flavors are on point my friends. Oh yes, and before I let you go, we must talk about the elephant in the room. There, I said it. I made a caprese salad without the cheese. For an Italian girl, this is kind of sacrilege, buttt on the other hand I don't eat dairy, so what can ya do? Rather than just ignoring the no cheese aspect of the dish, I decided to try and make a healthy swap. Helping the salad to still look like a traditional caprese salad, I nixed the cheese and went with chickpeas. I know, I know. They're not supposed to be there but you know what? So the way I see it, we're taking this salad up a notch in all the right ways. And plus I kind of want to dive head first into this bowl right now. Whisk together the dressing ingredients, reserving a bit of pepper to garnish, in a small bowl. 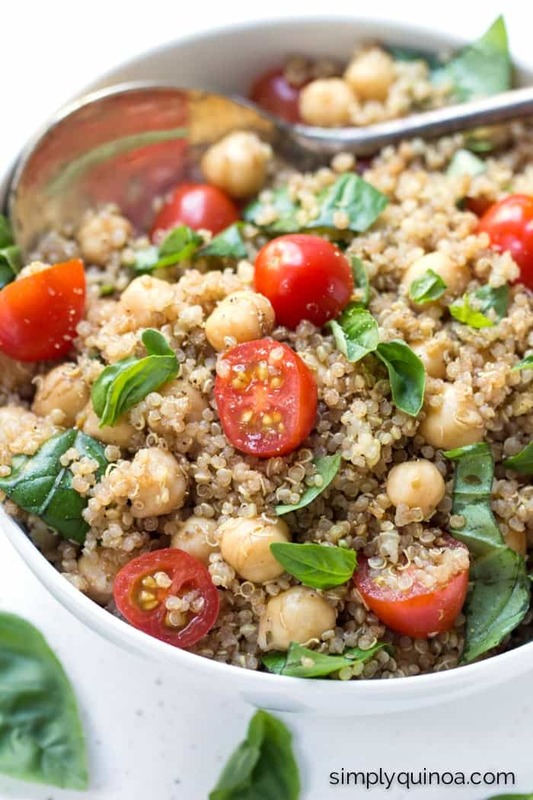 Pour dressing over quinoa salad and stir together until evenly coated. Garnish with some fresh cracked pepper if desired. Serve immediately or chill in fridge for 30 - 60 minutes. 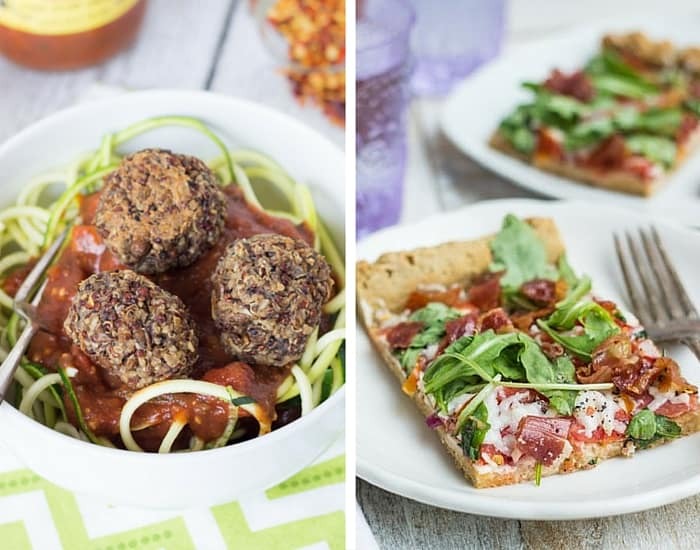 Delish and easy to make. Thanks! 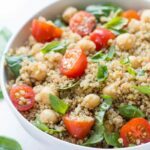 I love chickpeas, but as I’m NOT vegan, I believe I’ll try this both ways!